Ahoyhoy and happy Friday, internet! We’ve got a doozy of a update today for 1.11.2 Vivecraft. A real doozy. Here’s a video of some of the early testing in action. Thanks SuperFrodo95. We already had a run-in-place movement which has now been tweaked, and I’ve gone and added a jump and free climb mechanic heavily inspired by Climbey. The technical details and instructions are over on the new climbeymotion page. Here I’d like to get philosophical for a minute and explain why I’ve implemented it like I did as there have already been questions and I expect more. You’ll notice that both the jump and climb mechanics come to Vivecraft in the form of craftable, equippable items. This is something I’ve been meaning to delve into for a long time now and I think it worked out great. I could, of course, have done this ‘mode’ as a game setting, but implementing the mechanics the way I felt best required heavily overriding the behavior of the Jump, Move and Attack buttons. The thought of players needing to go into a menu to change a setting just to be able to mine again did not sit well with me. So here you have a simple item you equip, and can un-equip quickly to resume normal play. The added fun of crafting the items adds a nice layer to it as well. I reserve the right to change existing mechanics to items in the future (I’m looking at you, teleporter). One divergence I had to make is in Climbey you can just sorta fling yourself off the wall and gain a lot of height. Here I’ve implemented wall-jumping as an action that requires an extra button press. This way you know when you let go of the wall if you’re going to fall or jump explicitly. The need for this is because, behind the scenes, all input, logic, and movement in Minecraft only runs at 20hz. I get inputs from the VR hardware at 90hz and the noticeable delay and asynchronicity makes the jumping and timing less predictable than it should be. Determining the player’s intent leaving a wall from motion alone was just not going to work consistently. It still isn’t as consistent as I like and I see some re-working in the future. Another divergence is me not being a huge fan of Climbey’s run-in-place implementation. I found you can’t really move continuously without cheesing the system. It’s fine for their small spaces but Minecraft is huge and the start/stop got old quick. So I’m leaving our RIP speeds alone since it favors faster continuous motion over 1:1 movement. I did tweak our direction detection to use the average of the 2 controller’s pointing yaw, which is similar to climbey’s controller mode. This seems to work OK and reduces the ‘zig-zag’ effect of the older version. Overall this is a really fun set of mechanics and I already have many good ideas and suggestions for how to improve on it. If I were you I’d hold off on building challenge courses and whatnot for now as I expect the next few Vivecraft updates will contain tweaks to the jumping distances and whatnot. I do plan on having a ‘limited’ climbing mode where only certain types of blocks are climbable so you can build interesting courses, but that’s not in this version yet. I welcome all feedback and ideas. Discord is always the best place to come talk about Vivecraft. Please report bugs on Github, the locomotion was easy, getting it to play nice with the rest of the game was the challenge. Bugs are likely to exist. A major area of attention this week has been the Mixed Reality mirror mode. We now support using a 3rd controller as a moving camera. The Mixed Reality mode also defaults to an identical layout as Unity with 4 panes. 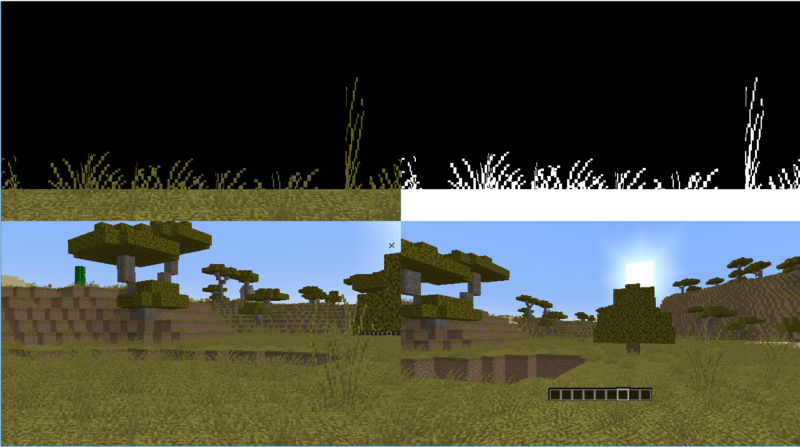 The player view can be rendered full un-distorted or as a copy of the HMD view. It’s got a ton of options so if you’ve got the equipment for it, be sure and check it out. The multiplayer VR animations also got some love. We were previously rendering the animations at the base 20hz of Minecraft’s network code. It now is fully interpolated to 90hz in both Vivecraft and the NonVR Companion mod. Fixed also were some bugs related to Players using Vivecraft in Seated mode. All nice and smooth now. Like butter. Some good work has gone into the Spigot plugin, Jaron has added several new commands and options for server owners. Discord user cool_nick_name has re-implemented the ‘headshot’ code from the older MineVive plugin. This allows admins to crank up bow damage for headshots! Additionally this update contains several important changes to allow climbeymotion to work in multiplayer, make sure you update and be aware that climbeymotion is OFF by default in the config.yml. You now have more binding options on both Vive and Touch controllers. The ‘touchpad swipe’ on the Vive and right joystick directions on the Touch can now be re-bound as you see fit. The ‘hotbar scrolling’ is also now on the right-hand controller for both systems. Many other little bugs fixed. Check the release notes for details. There should be an update to 1.7.10 somewhere in the near future. I do not know if the climbey stuff will make the jump. Keep your eyes peeled. NVIDIA broke minecraft with a driver update. They have released a hotfix. It is unknown at this time if the hotfix will require a hotterfix. Slicedlime, who made an entertaining Vivecraft let’s-play series a few months ago, has been hired by Mojang to work on the Pocket Edition plugin system. Could a Pocket Vivecraft be in the future? Some new entries in the Vivecraft Servers page. If you’re looking for some large communities to join we’ve got some now. Also Norn’s server is now known as Nornia, because obviously. Next Next post: Patches for your face.